These Squash based games provide an opportunity for all players, regardless of age, fitness or skill level to be able to build up their skills making a natural progression to play Squash. Playing modified games is satisfying and enjoyable way of increasing the necessary skills for squash. These games allow participants to progress at their own pace. Playing these games will increase fitness, physical strength, mobility, movement, and hand eye co-ordination. Playing games modified games on a squash court will help get used to playing within brick walls, as the ball rebounding can make the bounce tricky to judge. Court Games make it possible to cater for large numbers at a squash centre and make it possible to keep every participant busy. These games also add variety to the centre programs and therefore attract a wide range of patrons.irrespective of age. Mod Swot is a one wall game taking up an area about the size of half a squash court. If played on a squash court, behind the “short line” is out. This game form is for the least skilful with a racket and ball. In a school sports session this group using these game rules would be called Crocodiles. 5 Serves each (alternate boxes). Hit the ball on any bounce. All balls to land above the tin. So that all attending (irrespective of ability) can partake, each participant can be issued with an Evaluation Certificate, if required. Modified Squash has three simple sets/games designed to assist grouping and grading. By allocating 2 or 4 players per court or brick wall. 2 players score, 2 play, and they rotate positions..
Because the foam ball is not struck very hard by the children it will only rebound about 1/4 way down the court. Start the game close to the front wall and then move back as skill improves. The higher the ball is hit on the front wall the deeper it will rebound in the court. As the children progress give them a hit with the squash ball/mini squash ball at the end of the session so they can test their own ability. A round robin would require the following. 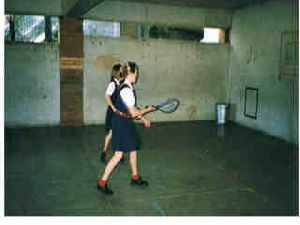 This is a 3-wall game and suitable for children with average ability with a racket and ball. Participants in this group would be referred to a BEARS in an organised program. 1 Elson Ball/Mini Squash Ball; 2 Mini Squash Rackets/Racket Ball Rackets/Squash Rackets. 5 Serves each from alternate boxes. One Foot in the Service Box. Bounce the ball to serve or throw it out of the hand. Serve may land on any side. Use three walls (except when serving). Hit the ball on the first bounce or Volley. Rules can spoil the game when there is limited skill. It is important to keep the rally going encouraging as many hits as possible. While games are in progress change players around and try to get an even standard of play per pair. By changing the size of the ball and speed as well as the size of the racket, the challenge can be made harder or easier. For organisation put 2, 3 or 4 players per court; have a Round Robin; 2 play, 2 score. Because of the childoren (particularly if their parents play) wanting to use a squash ball, at the end of each session give them a choice of ball if they want to test their ability level. Mini Squash is for children with above average ability with a racket and ball. For a group of children able to use this equipment they would be called Alligators. Elson Ball/Mini Squash Ball/Red Dot Squash Ball, Mini Squash Racket/Squash Racket. Throw the Ball up to Serve. Serve to land in the correct half-court. Use all walls as required (except when serving). During this phase all skills of squash should be experienced, i.e., serving out of the hand, returning the serve on the full, hitting the ball off the back wall, etc. 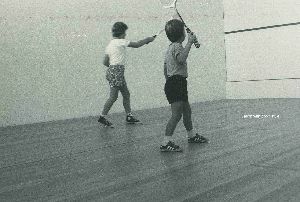 If the strategy of the game is taught early, and the ball is controlled, and all the skills experienced early the foundation of playing the game is solid. This phase has been used with Grade 12 students with limited ability and it proved fruitful - and the students enjoyed the programme. 1 Score Sheet & Pencil for each court.